The Television Academy announced its nominees for the 70th annual Emmy Awards on July 12. There are now six music categories in the prime-time race. My overview of the music nominees ran that morning in Variety, highlighting the possibility that an Emmy win for songwriters Benj Pasek and Justin Paul could make them EGOTs (having won all four major show-biz awards). For an Aug. 13 story, I interviewed the nominees for Music Composition for a Series (including Game of Thrones, Jessica Jones, Once Upon a Time, SEAL Team, Star Wars Rebels and Westworld). And for an Aug. 14 story, I interviewed the nominees for Music Composition for a Limited Series, Movie or Special (including Alias Grace, Black Mirror, Godless, March of the Penguins 2 and two different episodes of Electric Dreams). 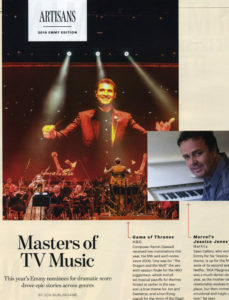 This entry was posted in Composers, Interviews, Television Music and tagged 2017 Emmys, Alias Grace, Emmy music, Emmy music nominees, Game of Thrones, Godless, Jessica Jones, Once Upon a Time, Pasek & Paul, Star Wars Rebels, USS Callister, Variety, Westworld on August 14, 2018 by Jon Burlingame.